Before any finish materials can be applied, the wood has to be about as perfect as I can make it: so I scrape it to its final shape, then dampen it with coffee, to simultaneously raise any fibers that had only been flattened by the scraper blades, but not smoothly sheared off, and, hopefully, add a slight “tan” to the wood, while doing no harm. Shaping complete, but wood un-treated. Coffee-stained, and sanded with 400-grit. Then it is time to begin the real finish: I first coat the wood with a coffee-suspension of very fine, powdered gypsum, hoping to add more color as I fill the grain with the gypsum. I vigorously rub this suspension into the wood, hoping to encourage the tiny particles of gypsum to actually settle into the pores of the wood, so as to fill them, and to slow down the absorption of varnish. It is considered undesirable, in general, to have the varnish really soak into the wood, as it tends to dampen the vibrations that make the sound. Some varnishes are more detrimental than others, but this is something I learned by reading Roger Hargrave’s notes. He is a world-class expert, so I tend to believe him that this is a good idea. I try to remove as much as I can of the excess mineral “ground” before it completely dries, rubbing hard, with a rag, but any that has settled into grain irregularities, I simply skim over, and leave it there. Mineral ground applied, front view. A little darker color, and the grain is more obscure. Back grain quite obscured by the gypsum. That will clear up entirely, with the application of the sealer. The sealer locks the gypsum into wherever it has been lodged, and clears the obscurity, making the gypsum completely invisible. The sealer I am using now is a concoction of pine resin, turpentine, and alcohol, with a little yellow tinting. The turpentine and alcohol evaporate, leaving the resin in the wood. After the sealer dries (a day or so), I begin applying the various coats of varnish: the first two or three coats are fairly yellow varnish, but after that, I begin adding the colors that will characterize the finished instrument. From this point, forward, the instrument will become increasingly darker, leaning toward reds and browns. Ultimately, I will try to emulate the look of the 1715 “Titian” Stradivarius violin, after which this insrument is supposedly modeled. We will see how it turns out. Violin back with three coats of varnish. Something I have occasionally done is to apply a few coats of varnish, then strip it all back off, down to the wood. It does not affect the mineral ground, nor the sealer, but it does affect the foundation color of the wood, much improving the finished look. But it is a lot of extra work…so I have only done it a few times. Regardless of how I accomplish the color I want, the next step is to level the varnish. 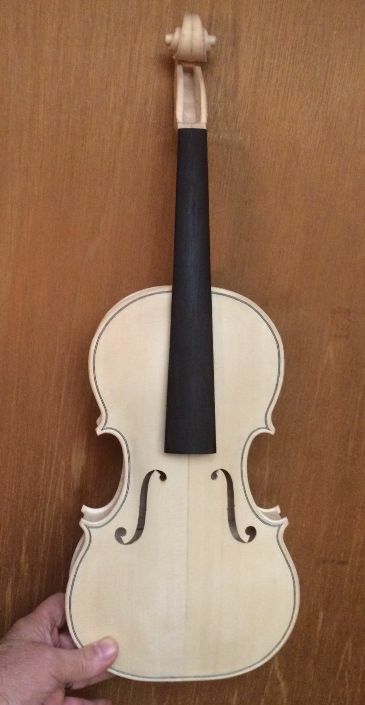 I use fine abrasive paper (400-grit), to gently remove any bumps, and to leave a matte-finish all over the violin. I am very careful to not fully remove the texture of the raised grain, left from the coffee stain, but only to scuff-up and smooth the varnish itself. The wood should have been the way I wanted it before I began varnishing. I prefer that my violins still have some “wood-texture”. Some people like the mirror-bright plastic look, but I don’t. On a guitar, that is one thing. These are supposed to be concert violins… another thing entirely. The important thing is to realize that any anomalies in texture will be highlighted by the varnish, not hidden. Something as small as a brush hair or a speck of sanding dust will become terribly obvious if one continues to varnish over it. (I learned this the hard way….) The varnish piles up around it and literally makes a mountain of a molehill. It pays to take the trouble to get things smooth before you move on. 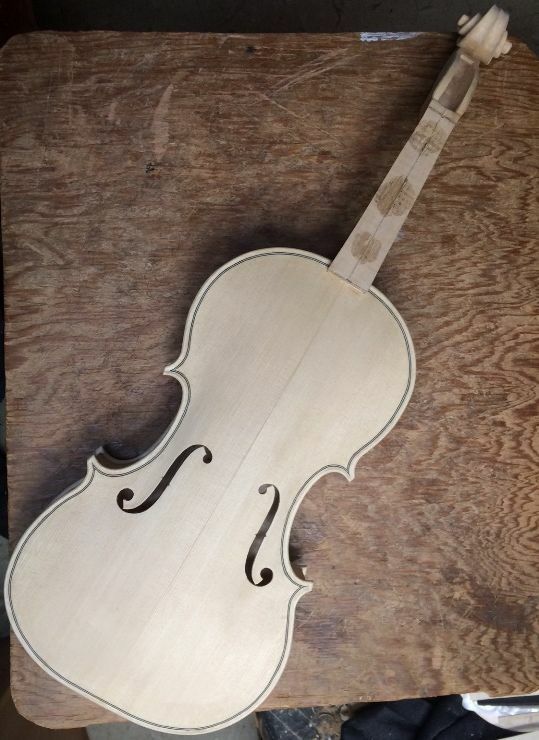 Fifth coat of varnish…side view of new violin. You can see the areas where I have left thin varnish, to imitate the look of an area where varnish is worn off. I will sand them, later, to add realism. And, the back! Again, you can see the “wear” areas. The varnish is taking on some of the depth of color and clarity that I enjoy. This one was mostly a case of adding strong color in the areas I wanted darker, and virtually none in the areas I want lighter. There was a tendency to streak, so I would feather the transitions out, using a fine sable brush, moistened (not wet) with alcohol. It worked well, but, if you look closely, you can still see streaks. These will be smoothed before the seventh coat, either by the alcohol method or by sanding. It is important to realize that, on the flamed maple, your brush-strokes should follow the flame, and on the spruce, follow the grain. In both cases, the natural lines in the wood tend to disguise any leftover brush-marks. Sixth coat of varnish: adding color in selected areas. Sixth coat of varnish on back; adding color in selected areas. I allowed the sixth coat to thoroughly dry, then sanded it with 400-grit, well-worn abrasive paper, and applied a final “color-coat”: after this one, I will only add yellow or clear varnish, to accentuate depth or shift the color range toward gold. Seventh coat of varnish on the back of the violin. The neck shows the original color of the wood. It will be stained and sealed at the very last step before set-up. I doubt you would really see a great deal of difference in this coat. The photographs are not very accurate in terms of color– I guess the flash does that. They are too red, and too bright-colored. It is not really that bright, but the color is shifting back toward gold, as I apply the last two or three coats in yellow varnish. Eighth coat (yellow varnish): This is nearing completion. There will be some minor retouch after everything else is done, but this is pretty much the way it will look. Again, the colors are not very accurate…but it does look nice. Just not this bright. So: I think that is about as far as I will take the color, for right now. I will very likely decide later that I want it darker, and, if I do, I can always add more color. But I think I will go ahead with the saddle, fingerboard, nut, etc. and see how I feel about it. If I decide it is fine the way it is, then I will go forward with set-up. If I want it darker, I can add color at that point, and another yellow or clear coat, and then do set-up. So, that is as far as it is going tonight.